Historic 'Tefilat Shla' gathering at home of Rav Shteinman for the future of the children of the Jewish people. 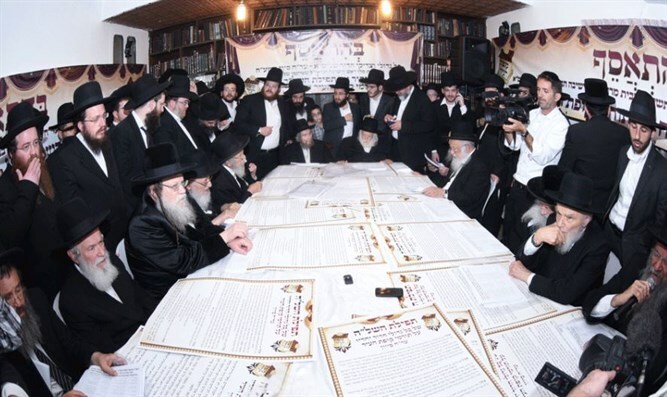 This week, Israel's most esteemed Torah scholars will gather at the home of Gadol HaDor Rav Aryeh Leib Shteinman for an important cause: The future of the Jewish people's children. For nearly 400 years, Jews around the world have recited the Tefilat HaShla, a special and powerful prayer for the protection of children. The Shla himself recommended it be recited on Erev Rosh Chodesh Sivan, also knows as Yom Kippur Katan. With Yom Kippur Katan approaching, many esteemed Torah leaders have pledged to use their precious time to say Tefilas Hashla for a specific list of people. Those on the list will be contributors to a Kupat Ha'Ir campaign which will help to support many of the dangerously poor men, women & children living in Israel. Selected donors will also receive a phone call from one of the rabbanim present, enabling them to listen to this historic prayer gathering live. The event is momentous in its combination of several powerful factors: The famous segulah of the prayer of the Shla, its impact on our nation's next generation, the prayers of Israel's spiritual leaders, and those impoverished families who rely on Kupat Ha'Ir for their next meal. Those hoping to add their children's names to the list can do so HERE for the next 48 hours only.